The US Olympic Women’s Ice Hockey Team are working with the IOC to see whether their goalies at the PyeongChang 2018 Winter Games will be forced to remove their masks with the image of the Statue of Liberty. Goalies Nicole Hensley and Alex Rigsby will wait to see if their goalkeeper’s masks featuring the image of the iconic statue in New York Harbor will be declared a ‘political symbol’, and therefore in violation of International Olympic Committee (IOC) rules. Under IOC Guidelines Regarding Authorized Identifications, no item may feature the wording or lyrics from national anthems, motivational words, public/political messaging or slogans related to national identity. The statue’s image adorns the left side of Hensley’s helmet, whereas Rigsby’s includes a stamp depicting the statue on the chin. Rigsby’s also includes a USA crest on the top, a drawing of the famous V-J Day kiss photograph in Times Square, and a bald eagle – the national US symbol. USA Hockey spokesman Dave Fischer said on Tuesday “discussions are ongoing” but that the issue would be resolved before Team USA continues its preliminary-round schedule against the Olympic Athletes from Russia (OAR) at Kwandong Hockey Center on Tuesday. National symbols of Russia are prohibited at PyeongChang 2018, due to a ban on the Russian Olympic Committee (ROC) that arose from allegations of state-sponsored doping in the country. 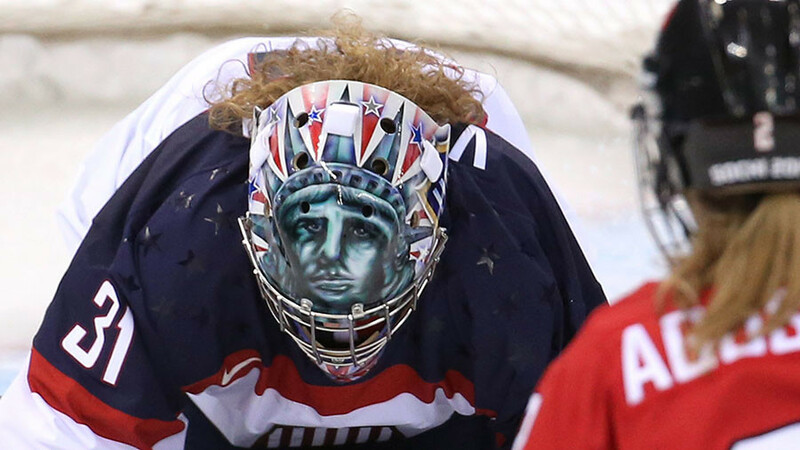 At the Sochi 2014 Winter Olympics, USA women’s goalie Jessie Vetter was allowed to keep the Statue of Liberty design on her helmet, but was ordered to remove the Preamble – the introduction statement of the United States Constitution – in order to comply with IOC rules. The Statue of Liberty is the third tallest statue in the world and the second tallest statue of a women, behind Russia’s the Motherland Calls in Volgograd, in the southwest of the country.